Final Fred Anderson Park Community meeting scheduled! The final Chicago Park District presentation of their plans for the Fred Anderson Park and DFA at 16th & Wabash has been scheduled for Tuesday November 20th. This will be an important meeting. It will be your chance to learn about and comment on the final plans for the new DFA, which will begin construction in 2013. UPDATE: The meeting is scheduled for 6pm, Tuesday, November 20th, in the Community Room at the 1st District Police Station, 1718 S. State. On September 4th, the Board of the South Loop Dog PAC met with Michael Lange, Project Manager of the Chicago Park District regarding the new park at 16th and Wabash (Fred Anderson Park), to discuss the planning for the new park and dog-friendly area. Board members Pamela Focia, Doug Freymann, and Gordon Stewart presented a number of ideas that we believe would make the new DFA a state-of-the-art recreational resource for people and their dogs in the South Loop. We outline some highlights here, but Mr. Lange asked that we not release details of the latest plan until the park district presents them at a public meeting. o The Park District will hold a public meeting to discuss Fred Anderson Park development plans in early October. As soon as the date is released you will be notified. 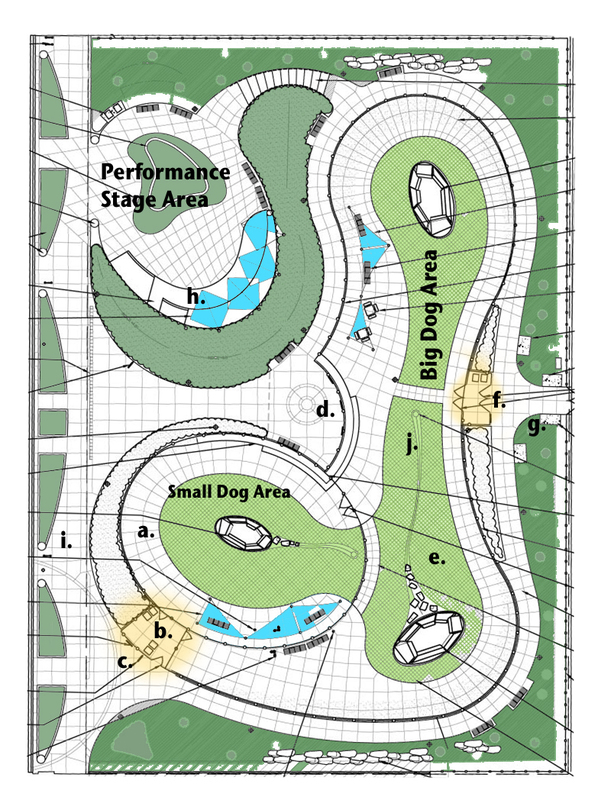 o As in previous proposals, the current plan includes a small public stage/performance area and a plaza area, in addition to small-dog and large-dog play areas, surrounded by a strolling path. o We emphasized that providing more than one entry point to the dog park would better serve the community. o We emphasized that the park surfacing should be a top priority, as coated asphalt is not ‘dog-friendly’. The CPD is considering an artificial, state-of-the-art ‘canine-grass’ surface, which is designed to be and will be built upon a specialized drainage substructure, for easy maintenance. o We asked that the dog park design be people-friendly as well as dog-friendly in order to promote (people) socialization and community building. o We asked that the ‘interface’ between the dog areas and outside of them be carefully designed so that educational materials (e.g. ‘how to greet a dog’, ‘what dog breed is that?’, etc.) could be posted to bridge communities, and, particularly, to teach kids about dogs. o Michael assured us that consideration of maintenance activities is an important element of the design. Service gates that we suggested be added will be large enough to allow equipment access. o Construction cannot begin until after approvals and bidding are conducted in Spring 2013. The anticipated construction start would be summer 2013 and construction will take several months. o The proposed DFA will be ‘large for Chicago’, but likely will not be larger than Wiggly Field or Grant Bark park. We’ve been doing our part to advocate for the best possible dog-park in the South Loop at Fred Anderson Park. But the Board of the South Loop Dog PAC is a small group, and we ask that you, as a member of the South Loop community interested in, and hoping for, a great local dog park, take action, too. Please keep in touch with us, come to our meetings, help us reach out to the public and to the press, and let your Alderman know how you feel. And watch for announcement of the public meeting in October! News Comments Off on Acadia Park! If this doesn’t get dog owners toasted, I don’t know what will. A great video from Better TV with helpful tips for taking your dog to the park…and keeping him safe while being a good puppy parent. A must watch! 9. Owners or other responsible persons must have a DFA permit with them for each dog visiting the DFA. 10. Each dog visiting a DFA must display a current Chicago Park District DFA tag. 11. DFA permits expire on December 31 of the year that it is issued. 12. Children under 12 must be accompanied by an adult; younger children must be closely supervised. 13. Only three dogs per person allowed. 14. Puppies under four months old and female dogs in heat are prohibited. 15. Failure to comply with the Cook County Department of Animal and Rabies Control Regulation for Chicago Park District DFAs can result in a fine. *Don’t discipline another person’s dog, but do remove your dog from an aggressive or inappropriate situation. *Play with your dog and pay attention to him, but don’t forget to let him socialize with the other dogs. *If you see another dog and their parent about to leave, call your dog over so they can leave easily. *Always shut the gate behind you. *Talk to people – chat about your puppies and give other dog parents a heads up if you’ve been there for a while and noticed anything unusual or a dog that could be potentially aggressive. *Fill the water bowl, take the time to rinse out the bowl and fill it with fresh water if it’s been sitting there for a while. What is a Dog PAC? Getting dog parks built takes a lot of support! 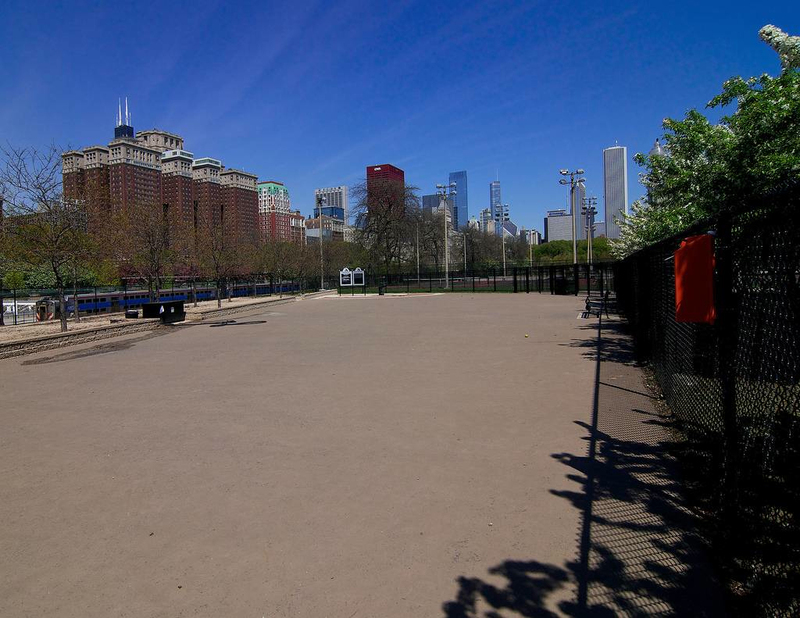 Luckily for us, the South Loop Dog PAC (which stands for Dog Park Action Cooperative) has taken the new 16th & Wabash dog park under it’s umbrella, which will make getting support for the new park much easier than if we had gone it alone. But what is a dog pac? The South Loop Dog PAC advocates for and supports responsible dog-ownership in Chicago’s South Loop. We provide and maintain safe off-leash areas for dogs and humans to socialize in area parks, and we work to encourage healthy and mutually beneficial dog-human relationships in the community. Today, the SLDogPAC is responsible for maintaining the South Loop DFAs, as well as planning and financially supporting any improvements or changes to the dog parks. 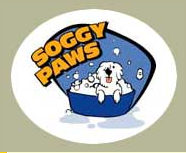 In addition, the SLDogPAC continues to promote responsible dog ownership, providing socializing opportunities for our dogs and their people, as well as educational information. Purchased 20 tons of gravel for Grant Bark Park and installed the 250 feet of gravel retaining mesh in the park. Requested repairs at Coliseum Park Dog Run to get the drains leveled and fences repaired – which are underway now. Worked as a liaison with the Chicago Park District for the creation of our new dog park to be created at 16th & Wabash Avenue. Continuously refilled the poo bag dispensers at both parks – 50 times – which is like 20,000 bags! As you can see, the South Loop Dog PAC is instrumental in creating and maintaining dog parks in Chicago. If you see their value as much as we do – AND want to help us get our dog park built, please consider becoming a member of the South Loop Dog PAC. Membership is as little as $40 and comes with a free t-shirt! Your dog will thank you. You can also buy a t-shirt, join the mailing list, or follow them on facebook and twitter as well. Our Meet & Greet with the South Loop Dog PAC was a success! Lots of dogs got in some quality romping and free treats while their human companions learned about the new dog park, became SL Dog PAC members, and munched on chips and guac! Check out some photos we snapped at the event then hop over to our facebook page to see more photos (and don’t forget to click “Like” if you haven’t already). Special thanks to DoGone Fun! for donating the space and doggie treats. We hope to see everyone at our next event! 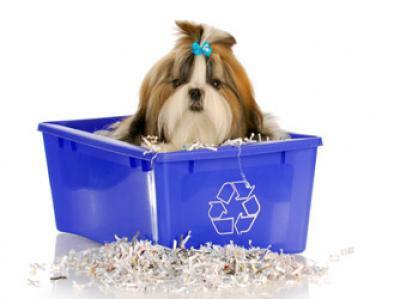 Earth day is this Sunday, so what better time to talk about going green with you pup. The most recent issue of Healthy Pet from Chicago VCAs had a great page devoted to going green with your pet, dogs and cats included. We only have one planet, so everyone (including Fifi and Fido) should help to keep it looking beautiful. No matter how big or small your pets are, they impact the environment too. 1. Adopt from a Shelter – Why buy a pet when you can adopt one of the millions of cats and dogs that enter shelters each year? 2. Spay or Neuter Your Pet – By spaying or neutering you’re preventing more homeless pets from being added to the population. 3. Repurpose What You Own – Old blankets and pillows can become a new dog bed. The lonely sock that lost its mate can become a catnip toy. 4. Turn Poop Green – Most of our pet’s poop ends up preserved in plastic bags in a landfill – use biodegradable bags and scoop poop often. 5. Protect Plants & Wildlife – Keep your dog on a leash when you’re outside and keep your cat indoors. Dogs may chase and catch wild animals or damage delicate habitats through good-natured romping and relieving themselves. 6. Shop Sustainable Goods – When shopping for toys and accessories look for products made from recycled materials or sustainable fibers like hemp or bamboo. Take time to read labels. 7. 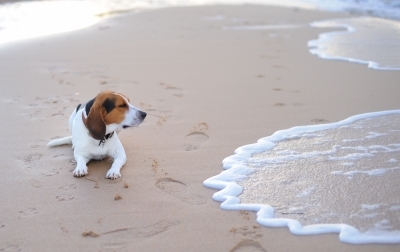 Use Natural Products – Clean up after your pet with products that are gentle on the planet and your pet’s senses. Read the labels! 8. Make Your Own Treats – Natural and healthy treats for dogs include carrots, popcorn (hold the butter and salt), and select raw veggies. Always consult your veterinarian first. 9. Offset Their Paw Print – Purchase renewable energy credits to offset your pet’s carbon emissions. 10. Go Digital – Ask your vet about microchipping (mandatory in Chicago). Also, ask to receive statements, bills, etc. from the vet via email instead of printing paper copies. Two other “green” pet thoughts we might add? Make sure to shop local, your local pet shops like Krisers and Soggy Paws in the South Loop usually by items from local or close to local vendors and often focus on natural, healthy, and eco themed accessories and treats – think natural by-product free food from Fromm’s based in Wisconsin. Also, consider donating slightly used toys, blankets, towels, and more to your local shelters. The Anti-Cruelty Society and Paws Chicago both happily accept donations of goods to keep shelter pets happy. If your dog doesn’t play with a toy anymore, why not recycle/reduce/reuse it by passing it on to a pet in need. What are some ways you go green with your pet? Make sure you stop by the Dog Friendly Meet & Greet this Sunday at DoGone Fun in the South Loop! We’ll be on hand to answer any and all your questions about the new Fred Anderson Dog Park or help you join the South Loop Dog PAC (If you join on Sunday, you get a free t-shirt!) We hope to see you, and your pooch, this Sunday! Looking for a book to help you navigate Chicago with your pup? 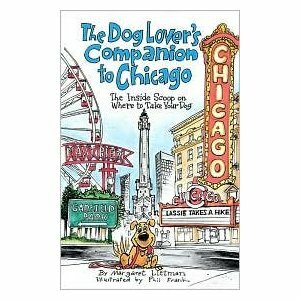 Check out The Dog Lover’s Companion to Chicago. It’s a great little book that breaks down the city by section and shares dog friendly places and tips. The latest edition is a few years old, so you’ll have to double check the places and events listed. Fingers crossed they’ll come out with an updated version soon! They give Grant Bark Park 4 paws up! Let’s hope our new dog park is open when the next edition of this book comes out. What are your favorite South Loop dog places? We recently read Planet Dog: A Doglopedia and loved it. It’s a great collection of fun dog facts, stories, and info. Ever wondered about the dogs that were first on the scene on 9/11? Curious about sled racing, canine acting dogs like Lassie, or Dave Berry’s thoughts on dog behavior? Check this book out. A great section we liked reading was “astrology for dog people.” Here’s what Stacey Wolf, a well public author of psychic books, a stand up comedian, and known for her spot on readings of celebrity, sport, and political predictions had to say about what dog breed’s characteristic you have based on your astrological sign. Aries: Jack Russel Terrier. You’re friendly, very feisty, and completely untrainable. You have boundless energy to run around and mess things up! You also like to be the center of attention. Taurus: Saint Bernard. You are a big, mushy, loveable, slobbery kind soul. You love to work and help people with a lick and a smile. Let’s not forget your stubborn streak, once you get your paws into something, you’re not likely to go soon. Gemini: Yorkie. You are really cute, bouncy, very yappy, and best of all, you have really well groomed hair – with accessories to match. Leo: Great Dane. The king of all dogs, You do everything larger than life, from the way you walk to the way you play. You command attention and have a big, loud bark! Virgo: Westie. The dog in you is stubborn and pleasing. You were once the cutest and best groomed pooches around, and you love to work too. Once you get into a good bone, you can dissect the thing for hours with energy and determination. Libra: Greyhound. Your inner dog is both graceful and classic. If you had it your way, you wouldn’t use your speed for racing – you’d run from one party to another. You don’t like to work – just to play. Scorpio: German Shepherd. As the master of the universe you are the most intense breed. You inspire both awe and fear. YOu are cautious around strangers but love your best friends. You strut with an air of mystery. Sagittarius: Golden Retriever. One of the friendliest breeds, you love everyone you come into contact with equally. You are always up for new adventures, but love to come home for a good nap at the end of the day. Capricorn: Pug. You are cute and cuddly but balance that with a feisty independent streak. You are mostly good natured, but every once in a while you give a loud snort if something isn’t going your way. Aquarius: Miniature Schnauzer. You’ve definitely got a mind of your own, but no one can really understand what’s going on in there! You are cautious with strangers and like to bark a lot – sometimes about nothing. Opinionated and adventurous, you are always up for a good sniff. Pisces: Toy Poodle. You just want to cuddle up to someone you love all dat long, do nothing, get carried everywhere, and never let your feet touch the ground. Being treated like a princess or prince isn’t bad either. 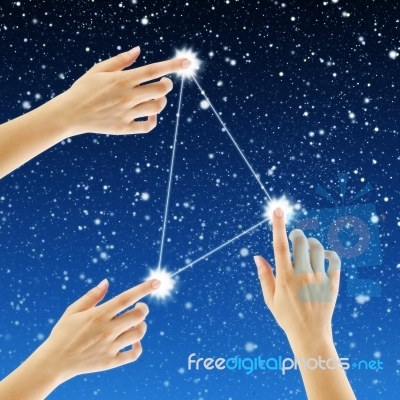 What was your dog breed according to the stars? Do you agree? Does it describe you? We all know about the benefits for dogs in dog parks (like socialization, excursive, stimulation, etc) but what about some of those less obvious reasons? Dog parks offer a host of benefits…even to those that don’t have a canine companion or choose not to use the park at all. Here are our top three favorite unexpected benefits to building a dog park. 1. Green Space – Trees give us necessary oxygen and plants have been proven over and over again to make people happy, literally. Wouldn’t you rather a vacant lot be turned into a place for greenery than remain vacant, weed filled, and a collection space for debris and trash? 2. Less Poop – As you know, abandoned dog poo is a problem (if you don’t already know – just check out South Poop to learn all about the South Loop poop epidemic), but give all those doggies a place to play and poop, and their owners some free bags, and they’ll be less poop on the sidewalks. Plus, dog owners are more likely to pick up their dogs poop (or even someone else’s) inside a dog park than a random lot or sidewalk. 3. Safer Parks for Kids – A common parent complaint is about the danger off leash dogs pose to children playing in parks. They’re worried Fido will knock over their little tot as he frolics in the grass. With a designated place for dogs to play, kids can roam without fear of being disturbed by dogs, and vice versa. Running dogs probably don’t like kids getting in their way either. And building more and more dog parks mean that people will be able to use them with ease and not have to resort to letting their dogs off leash in people parks. Can you think of any other unexpected benefits of dog parks?